Westside Gardens is a leading full service florist serving the North Chili / Rochester area. 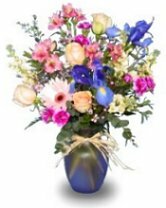 Our designer/owner has over 37 years of experience in the floral industry. Whether you prefer something time-honored and traditional or something contemporary and modern, we design our arrangements with you in mind. At Westside Gardens, we will design breathtaking arrangements for all occasions from sympathy, weddings, anniversaries, birthdays, get well, new baby, thank you, and just because. We carry a large selection of fresh flowers,as well as green plants and dishgardens, balloons,and chocolates. Our shop is conveniently located on Buffalo Road in North Chili, New York. We're open Monday - Saturday to serve your floral and gift giving needs . Extended hours available during holidays.